Reader's Digest Association, 9781621452256, 167pp. Growing up in 1950s California, young Anson William Heimlich showed very little promise. Clumsy, unsure of himself, and made to feel like a failure by his disappointed artist of a dad, Anson started working odd jobs as a teenager to help support his family. His boss at one of these jobs, an aging African-American janitor named Willie, unexpectedly became a mentor--and the lessons he taught young Anson proved to be invaluable throughout his subsequent career as an actor, director, and entrepreneur. 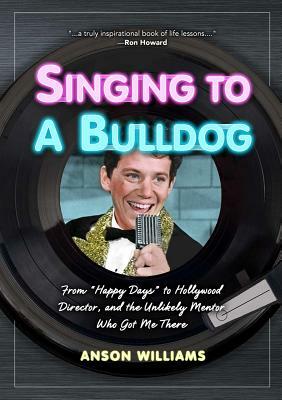 In Singing to a Bulldog, Anson Williams (as he came to be known) relates both these lessons and the never-before-revealed stories of the many seminal TV series he has worked on and the famous (and not-so-famous) folks he's encountered during his 40 years in Hollywood, including: - being directed by Steven Spielberg in his first dramatic role - getting kidnapped by Gerald Ford's daughter at the White House - subbing for Sammy Davis, Jr., as a headliner with Bill Cosby - being humbled by Sunny, a young volunteer for the Cerebral Palsy National Organization - mentoring Shailene Woodley on the set of The Secret Life of the American Teenager and many more. Best known for his Golden Globe nominated role as Warren "Potsie" Weber on the series Happy Days, Anson Williams is also an award-winning television director and writer as well as a singer and producer. He has directed more than 300 hours of television for a variety of series, including Beverly Hills, 90210, Sabrina the Teenage Witch, and The Secret Life of the American Teenager. He won the prized Humanitas Award for his writing, has been honored by the United States Patent and Trademark Office, and served on the board of the USO. Together with business partner JoAnna Connell, he founded StarMaker Products, an international product company. He lives with his wife and five daughters in Los Angeles, California.